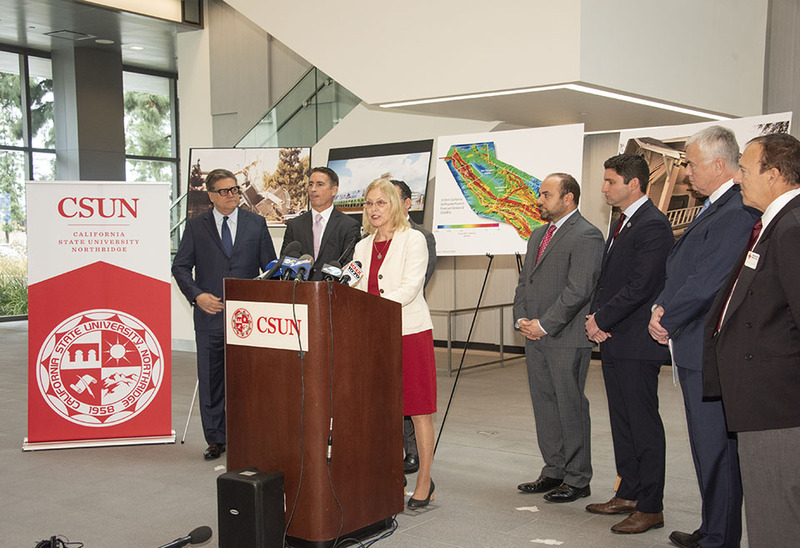 On Jan. 17, 2019, CSUN President Dianne F. Harrison is joined by local elected officials including (L-R) State Sen. Bob Hertzberg, LA Deputy Mayor Jeff Gorell, and Assemblymembers Adrin Nazarian and Jesse Gabriel -- as well as statewide officials Glenn Pomeroy, CEO of the California Earthquake Authority, and a representative of the American Red Cross -- as she commemorates the 25th anniversary of the Northridge Earthquake. Photo by Lee Choo. 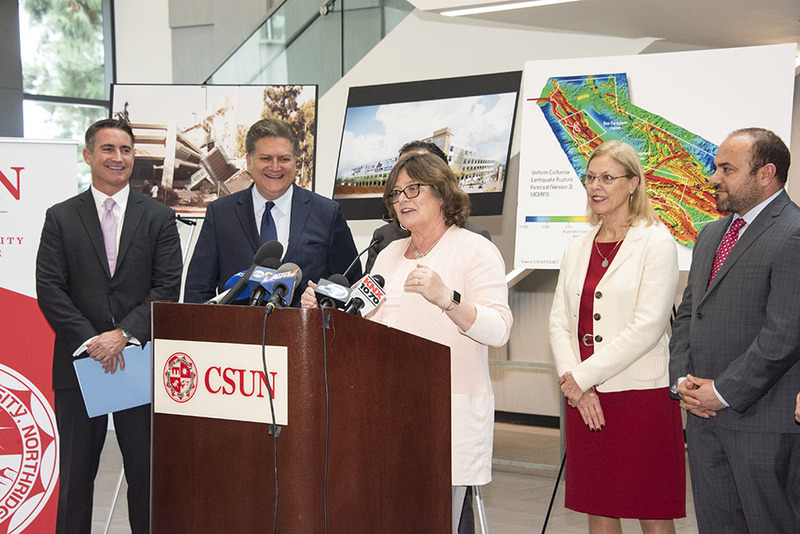 Seismologist and local preparedness expert Lucy Jones (center) joins (L-R) LA Deputy Mayor Jeff Gorell, State Sen. Bob Hertzberg, CSUN President Dianne F. Harrison, Assemblymember Adrin Nazarian and other elected officials as CSUN commemorated the 25th anniversary of the Northridge Earthquake, on Jan. 17, 2019. Photo by Lee Choo. As always, seismologist and earthquake preparedness expert Lucy Jones got straight to the point. Along with State Sen. Bob Hertzberg (D-Van Nuys), Los Angeles Deputy Mayor Jeff Gorell and numerous other elected officials, the former U.S. Geological Survey scientist visited California State University, Northridge on Thursday afternoon to stand with CSUN President Dianne F. Harrison and commemorate the 25th anniversary of the Northridge earthquake. At 4:31 a.m. on Jan. 17, 1994 — Martin Luther King Jr. Day that year — a magnitude 6.7 earthquake struck the San Fernando Valley, killing 72 people. It injured 9,000 people, destroyed 22,000 homes across the region and caused catastrophic damage throughout the CSUN campus. Among the victims were two CSUN students who perished in the collapse of Northridge Meadows apartments. It was a seminal moment for the university, which reopened for spring semester classes just two weeks after the disaster struck. The slogan shared at the time was, “Not just back. Better.” And the CSUN staff and faculty were true to their word. It took herculean efforts to coordinate with all agencies — city and state emergency responders, federal disaster assistance, elected officials — but CSUN faculty returned to teach, and students tromped through the mud to attend classes in portable classrooms for years. The Class of 1994 graduated on time. Numerous buildings and parking structures on CSUN’s campus sustained severe damage, including the iconic Delmar T. Oviatt Library, whose east and west wings were badly damaged. The quake was the most expensive U.S. natural disaster until Hurricane Katrina’s toll on New Orleans in 2005. CSUN itself rose from the natural disaster like a phoenix from the ashes, taking advantage of federal assistance dollars to modernize the campus and complete new parking structures and new buildings that included University Hall (administration), Manzanita Hall (journalism, film, communication studies), Chaparral Hall (biology and botany), Sequoia Hall (health and human development) and many more. “I’m honored to be here today to represent the university and the strides we have made regarding emergency preparedness and earthquake safety for our nearly 40,000 students and close to 5,000 staff and faculty,” Harrison said Thursday, as she stood side by side with city and state officials. “We at CSUN know all too well the devastation, the pain, the heartbreak that an earthquake can cause,” she said. “Twenty-five years ago on this very day, a powerful earthquake rocked Southern California and forever altered the lives of so many, including lives lost. Harrison thanked State Assemblymembers Jesse Gabriel (D-Northridge) and Adrin Nazarian (D-Sherman Oaks), LA City Councilman Bob Blumenfield, Gorell, Jones and Glenn Pomeroy, CEO of the California Earthquake Authority (CEA), for helping CSUN commemorate the anniversary and pushing for increased earthquake safety and preparedness for homes, schools and businesses. Hertzberg, who lost his own home in the 1994 quake, announced a plan to sponsor state legislation for $1 billion more for the nonprofit CEA to “brace-and-bolt” retrofit single-family homes to their foundation. He noted that the Northridge earthquake cost the region $25 billion in damage. California faces a 99.9 percent chance of a damaging quake (magnitude greater than or equal to 6.7) in the state in the next 30 years, according to UC Berkeley seismologist Peggy Hellweg. Hertzberg noted that 1.2 million older houses statewide have not been retrofitted and are vulnerable to damage in a major earthquake. “A code-compliant retrofit could cost about $3,000, and it could prevent a family from losing everything — it could be the difference between life and death,” Hertzberg said. Gorell, who serves as deputy mayor for public safety, lauded the efforts of city safety and building officials to retrofit buildings throughout the city. By 2024, the city plans to retrofit all 12,865 multi-family residential buildings with so-called soft story ground floors (including those that have residences built over carports and garages) — the design that doomed the Northridge Meadows apartments. He also used Thursday’s anniversary as an opportunity to call on all CSUN students, Angelenos and residents throughout Los Angeles County to download and use the free mobile app ShakeAlert LA, a new early-alert system that can provide a few seconds of warning — to allow people to slow their cars down and pull over, stop an elevator and get out, or move away from glass windows. The app has had more than 373,000 downloads in the LA area, Gorell said. He also urged city residents to sign up (via email, text or phone) for Notify LA, the city’s emergency alert system. Jones, head of the Dr. Lucy Jones Center for Science and Society, which she founded in 2016, was with the USGS for 30 years — including in 1994, when she served as a voice of information and calm for Californians in the temblor’s aftermath. “I’m probably the only one up at this podium that doesn’t think Northridge was a big earthquake,” Jones said. “It was only a 6.7. What it means to be a big earthquake is not stronger shaking at some site, it’s strong shaking at many more sites. Half a million people received strong shaking in the Northridge earthquake. When we have a 7.8 on the San Andreas fault, we’ll have about 10 million people receiving an equivalent level of shaking, and that’s why it’s different.